It’s no secret that I love pizza! Normally I am not a huge fan of Chicago deep dish style, but there is one exception and that is at Chicago Pizza and Oven Grinder Co. More commonly known to Chicagoans as just “Oven Grinders”, this restaurant is a must try for sure! Located in the basement of a three-story old house in the heart of Lincoln Park, the rumor is that this location was used as the lookout post for the St. Valentine’s Day Massacre which occurred across the street in 1929. 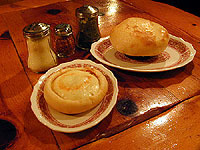 Oven Grinders is most famous for their pizza pot pies, but their menu also consists of oven grinders (Italian sandwiches) and salads. 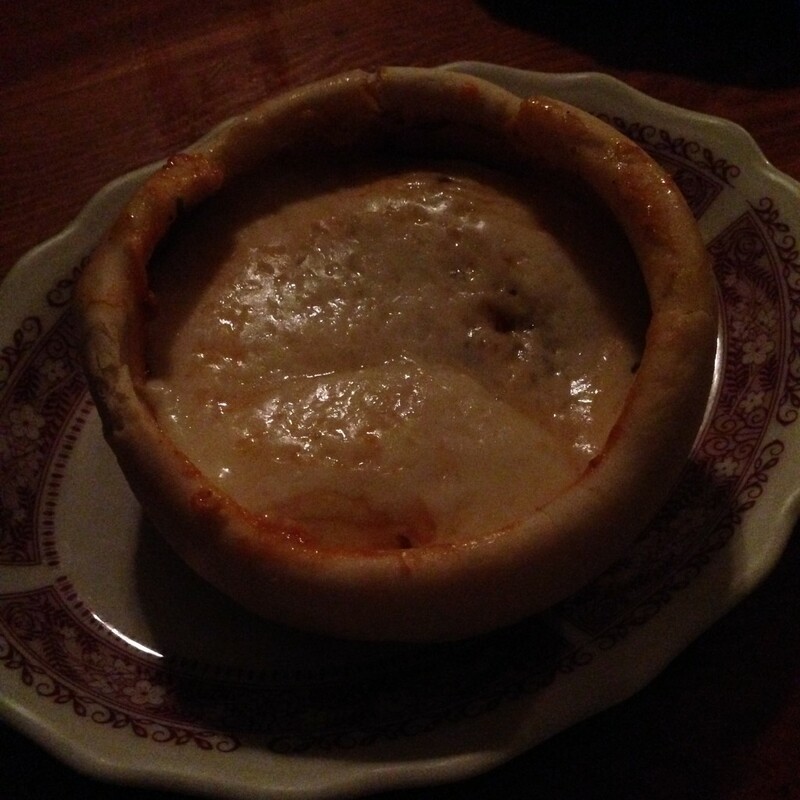 The pizza pot pies come in two sizes: the half-pounder and the one-pounder. There is only one kind of pie which consists of cheese, tomato sauce, green peppers, onions, sausage, and whole fresh mushrooms. You can also order pies vegetarian if you prefer. When the pizza is brought to the table, it comes out “upside down” with the dough on top and the rest of the ingredients underneath in the pot. The waiter will then run a knife around the edge to loosen the dough and flip it over on your plate so the dough is now on the bottom. This is when you dive in and start eating beginning with all the gooey cheese! Even though a half-pounder is more than enough to fill you up (I can’t eat the whole thing), you must start out the meal with their famous Mediterranean bread! The bread is a huge piece of thin pizza dough topped with olive oil, Italian spices, and Parmesan cheese. 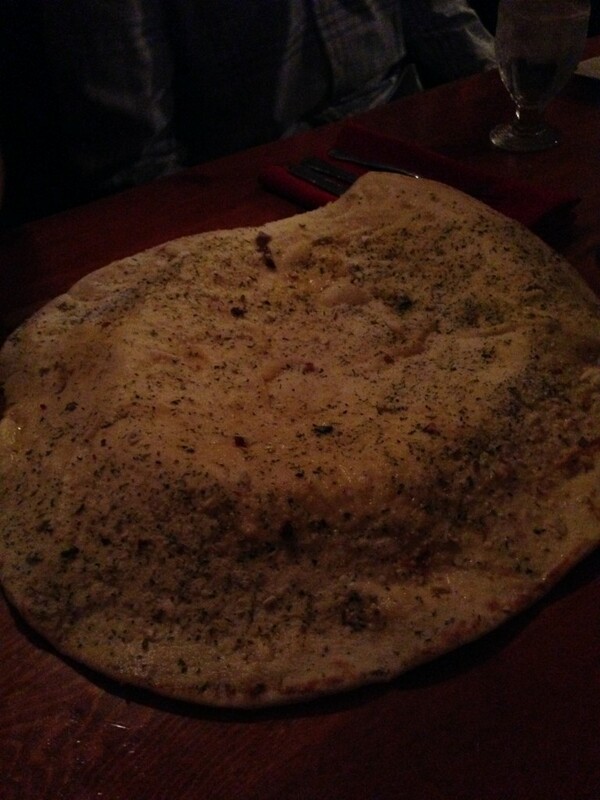 It’s so big the dough hangs over the edge of the plate it’s served on. Expect to wait for at least 45 minutes to get a table on any given night. The restaurant doesn’t accept reservations and the Maitre’ d is kind of infamous for only giving tables to people who are nice to him. He doesn’t ever ask for anyone’s names and supposedly just remembers the order of who came in first. I’m pretty sure he goes back to the kitchen and writes down on a piece of paper a descriptor of whoever he talks to (i.e. blonde hair, pink scarf), but half the fun is thinking you have to win him over to get in. Also, the restaurant is cash only so be prepared when planning your visit. Over Grinders is such a Chicago staple so whether you live in the city or are just visiting, I highly recommend adding it to your list of places to try! I love all the stories you share with your restaurant reviews! 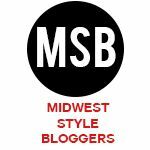 Makes us non-Chicagoans feel like we are in the know!! Thanks Kelly!! Next time you are here we will have to go to Oven Grinders! 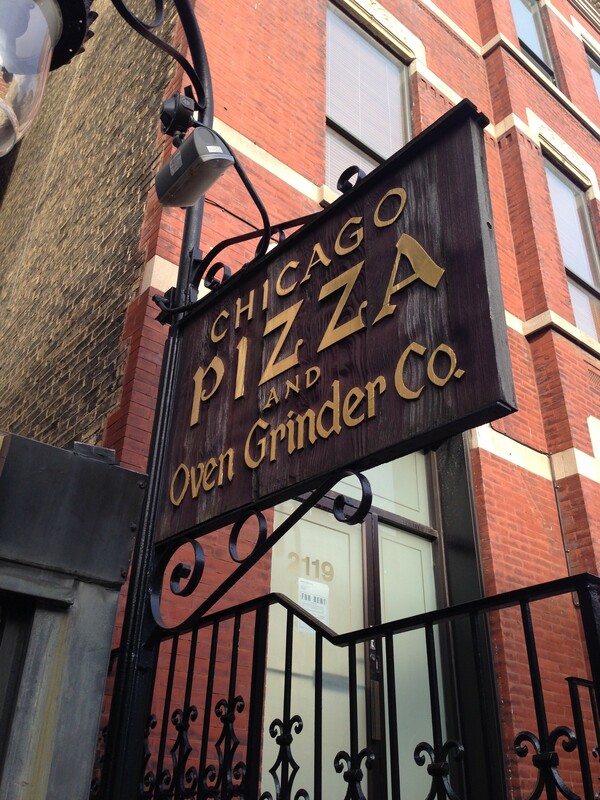 I walk by Chicago Pizza and Oven Grinder all the time and have been wondering whether or not it’s good! I love the building so, I’m so glad to hear the pizza is good! Also, love the stories you incorporate. I’ve lived in this area fora few months now and had no idea the St. Valentine’s Day Massacre occurred so close! Definitely try their pizza pot pie for your next dinner out! You won’t be disappointed! And yes, it’s kind of a cool history of the place knowing Capone was there. I have always wanted to try this place. Great review!